Free-surface problems, where the boundary of a moving body of fluid evolves as part of the dynamics, are one of the most interesting and challenging areas in the field of fluid dynamics. Such problems are ubiquitous in natural settings over a wide range of physical scales, from the propagation of surface waves on oceans to the spreading of raindrops on plant leaves. These systems exhibit intricate behaviors and have inspired many different types of applied studies in physics and engineering such as using fluid wetting to test substrate material properties, improving transport in designs of microfluidic devices, and investigating self-assembly of patterned materials. 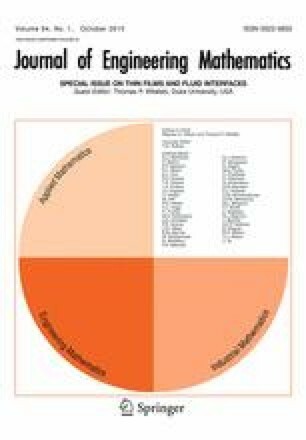 Likewise, free-surface problems have been a long-standing source of fundamental mathematical questions on how to formulate models, analyze systems of nonlinear partial differential equations, and compute efficient numerical simulations. Within the broad spectrum of free-surface problems, one of the most developed branches concerns the behaviors produced by slender bodies of fluids, such as jets and thin sheets . These problems are fundamental to many physical situations including coating processing that involve the spreading of thin films of fluids on solid substrates . The governing equations for these flows are derived through the use of longwave asymptotics and lubrication theory. The resulting mathematical models are higher-order nonlinear partial differential equations that include the influences of surface tension and the geometry of the problem. Some notable papers have given overviews of physical [3, 4, 5, 6, 7, 8, 9, 10], mathematical [11, 12, 13, 14], and computational [15, 16] aspects of this field. Contributing to this rich and active field of research, the motivation for this special issue of the Journal of Engineering Mathematics came from the workshop on “Thin Liquid Films and Fluid Interfaces: Models, Experiments and Applications” held at the Banff International Research Station (BIRS) on December 9–14, 2012 . The workshop added to the growing list of focused meetings organized by various members of this research community. Some of the other conferences in the field were held at BIRS in 2003–2010 [18, 19, 20, 21], UCLA’s IPAM center in 2006 , the EUROMECH 490 workshop in London in 2007 , two meetings at ICMS in Edinburgh in 1999 and 2009 (EUROMECH 497) [24, 25], at the Fields Institute in 2012 , and the 2013 programme at the Newton Institute at Cambridge University . Several of these meetings have inspired special issues of journals containing new research results on thin film problems [28, 29, 30, 31, 32]. An international and interdisciplinary array of researchers in physics, engineering, and applied mathematics attended the 2012 BIRS workshop. Physical problems discussed at the meeting spanned applications from nano-scale to geophysical settings and physiological to industrial contexts. Mathematical questions on modeling of complex fluids and fluid–structure interactions also led to spirited interactions among the conference participants. This special issue consists of seven articles that touch on several of the computational, analytical, and experimental themes that were represented at the workshop. The first paper, by Afkhami and Kondic, is a computational study of inertial dewetting of nano-scale liquid drops. The article by Sibley et al. gives an overview of different analytical models for the dynamics of moving contact lines for spreading drops. The work by Huth et al. presents an overview and a new approach for computing of the spreading of droplets on top of other fluid layers. The paper by Swanson et al. compares experimental and modeling results for the spreading of surfactants on thin films. The behaviors of thin films subject to the influences of Marangoni effects produced by applied thermal and electrical forcing were studied in the paper by Corbett and Kumar. The remaining two papers in the special issue present different examinations of flows of thin films of non-Newtonian fluids in the classic problem of flow down an inclined plane . In their paper, Lam et al. examine the instabilities in a model of gravity driven flows of nematic liquid crystals. In the final paper, Pritchard et al. derive similarity solutions for generalized families of non-Newtonian models with shear-rate dependent viscosities. On behalf of all of the organizers of the 2012 BIRS workshop (R. P. Behringer, K. Daniels, R. Levy, O. K. Matar, M. Shearer, T. Witelski), I would like to thank the personnel of BIRS for hosting our workshop. I also want to acknowledge the support of the National Science Foundation, which helped fund the travel of students and junior researchers at the meeting [FRG: Collaborative Research: Dynamics of Thin Liquid Films: Mathematics and Experiments (2010–2013) under Grants DMS #0968258 (Shearer, Daniels), DMS #0968154 (Levy), DMS #0968252 (Witelski)].